When Elephant Grounds popped onto the scene on Gough Street in Central at the Woaw Store, the name was synonymous with one thing only- ice-cream sandwiches. 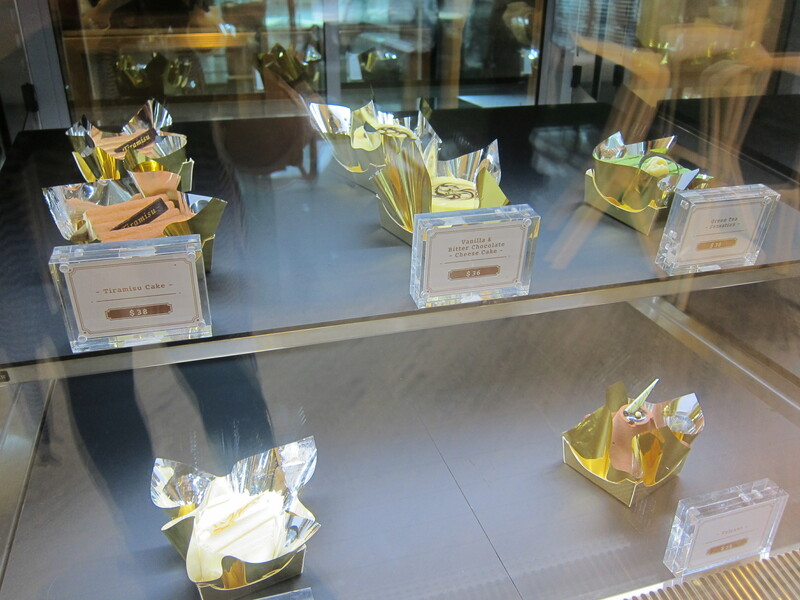 Forget the coffee that they were brewing, no no, people of Hong Kong were solely interested in this seemingly holy grail of desserts, the iPhone equivalent of ice-cream. A new flavour every weekend and a limited supply; their Instagram announcement of the fresh creation generating a wave of palpable excitement, such that friends were clamouring to get there early enough to get their hands on one. It took a while for this feverishness to die down and when it finally seemed a bit calmer, I casually swanned in one Sunday afternoon when in the area and got their Forbidden Crumble ice-cream sandwich which was a) beautiful to look at b) exciting, as apple crumble is one of my favourite desserts so I was already loving it without even tasting it c) bloody difficult to eat gracefully. Call it a sugar high, but I suddenly understood the craze. Cinnamon ice cream with green apple and a crumble cookie finished with caramelized apples and almonds tasted as delicious as it sounds and as I stood in the street between cars, gingerly biting into it, apple bits and almonds perilously sliding off rapidly melting ice-cream, I remember thinking it’d be grand to have another branch a little closer towards North Point. There is zero room inside the Woaw Store for a coffee and a natter and their other branch at Wong Chuk Hang is too out of the way. But, back to EG and the branch in Causeway Bay is quite lovely and is the older, mature, more sophisticated and obviously much larger version of the Gough Street counterpart, with its minimalistic wooden tables and chairs and a cool counter top to perch at. The menu is more than just ice-cream sandwiches and coffee too. There’s a rather tasty selection of dishes including hamburger, salmon donburi, ramen and kale quinoa salad. I’d already frequented this branch for the odd coffee or two with friends and love sitting outside watching the world go by. I hadn’t really paid attention to their coffee philosophy of, “The finest beans. Appropriate roast. Correct brewing method. Great presentation”, but suffice it to say I have no complaints about their coffee, aside from the price, which is tad steep at $45, once you compare it to the cost of some of their dishes, but nonetheless their French Vanilla coffee is done nicely and you can’t go wrong with their latte. On yet another horrendously rainy day, I was kindly invited to try out a couple of dishes from their brunch menu and sampled the Torched Salmon Donburi ($88) with an onsen egg, pickled cucumbers, mixed greens, roasted corn and sesame dressing and their EG burger ($106) which is 8oz of USDA prime beef patty wedged within a brioche bun served with a fried egg, cheddar cheese and fries. The salmon donburi is a hearty size and prettily presented. I enjoyed the variety of ingredients going on in my bowl and of course, an onsen egg on top of anything will always make things that little bit tastier. The burger is also quite substantial- the beef patty meaty and juicy and topped with a good amount of melty cheese and another egg. Protein overload! The fries were good and I ended up munching on more than I intended despite needing to leave room for ice-cream! Ah yes, the ice-cream. Japanese Taro ice-cream, one of my favourite flavours. There’s a fairly extensive list of atypical flavours such as Thai iced tea and Rose water rhubarb, but the minute I heard Taro, I needed to try it. This was definitely the best part of the meal, and I love how the ice-cream includes candied taro chunks which really livens up the ice-cream to give it that extra texture. Absolutely delicious! Now that Fashion Walk has undergone yet another face-lift with EG and Burger Room amongst others moving in, the ‘hood is looking quite a lot more interesting. Although EG is meant to be all about the coffee, somehow the ice-cream became the headliner, whether deliberately or not, I don’t know. In any case, I admire how they are striving to expand their repertoire, so let’s see if the coffee and the food become as memorable as their sweet offerings. This meal was by invitation- many thanks to the EG team for the kind hospitality. Categories: Cafe, Coffee, Dessert & Puddings | Tags: Cafe, Causeway Bay, Central Hong Kong, coffee, Elephant Grounds, Fashion Walk, Gough Street Central, Hong Kong, Ice cream sandwich | Permalink. Nope, this isn’t a post about drinking chic coffee in Mayfair in London sadly, fooled you! But, I write this as I stare out of the window at the disgustingness that is a red rainstorm and can’t help but think of England and how the weather is most probably crap as well. Joys on both sides of the Earth. 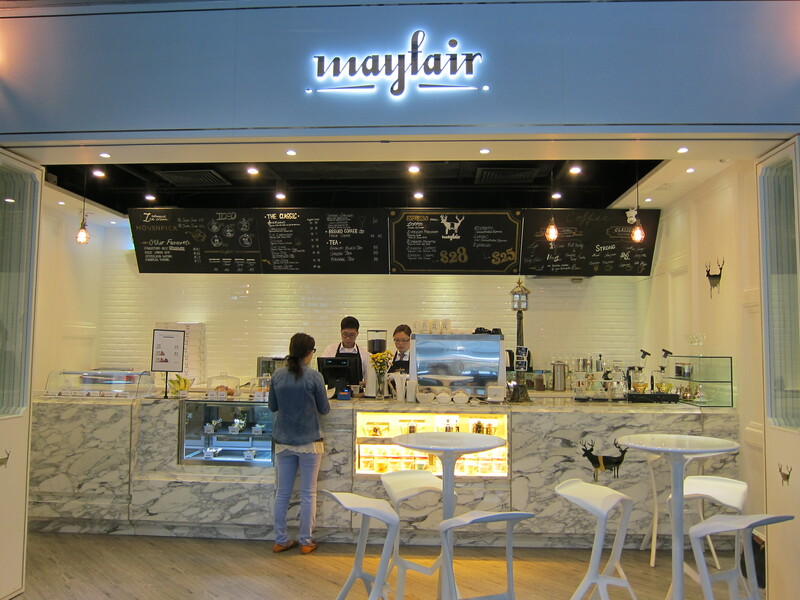 So it’s quite apt that there is now a coffee place in HK called Mayfair where you could TRY and sit back and think of the green and pleasant land that is home for us Brits. Given how awful the HK weather has been recently, nothing quite beats the dreariness like a cup of tea, (obviously) or a lovely coffee brew. I don’t pretend to be a coffee snob; in a previous life, I used to drink the worst kind of canteen and instant machine coffee there is- sometimes up to 4 cups of this thick, black sludge a day to combat droopy eyelids, much to my taste-buds’ dismay. Now, Starbucks is also a usual go-to- I am a Starbucks lemming ordering my hazelnut lattes. 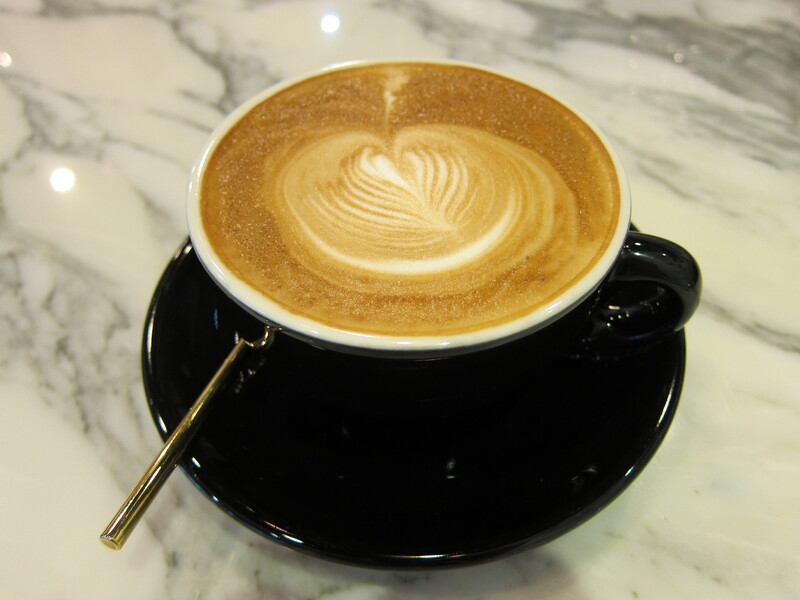 But, there are some great cafes in Hong Kong- Cafe Corridor in Causeway Bay, (though sometimes their coffee arrives a little on the tepid side), 18 Grams, Rabbithole. 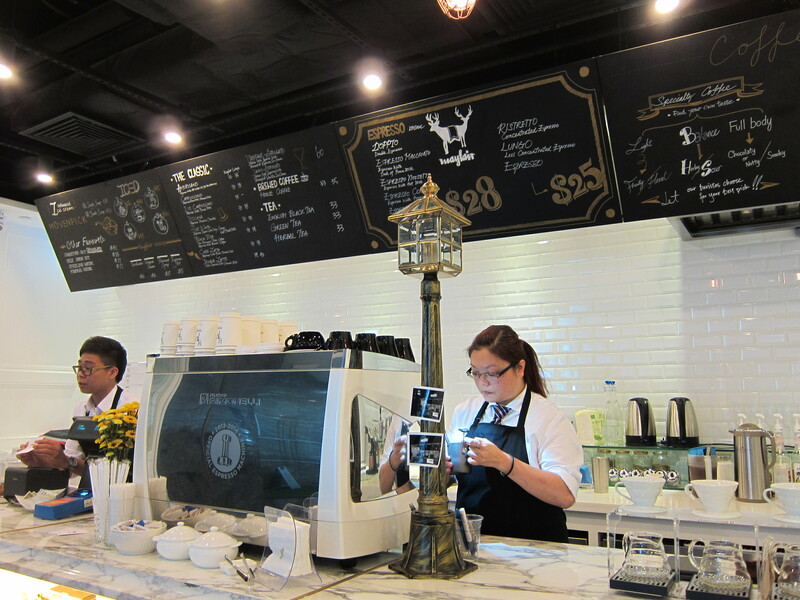 And now, I’ve decided I quite like newcomer and independent coffee outlet Mayfair Coffee, at the Center in Central. Mayfair, opened by Ken Pong, takes its name from that well-known posh area in London. The outlet is small, practically an area chiseled out from the wall, seating no more than 6 and serving more as a quick pit-stop or ‘drive-through’ for coffee. 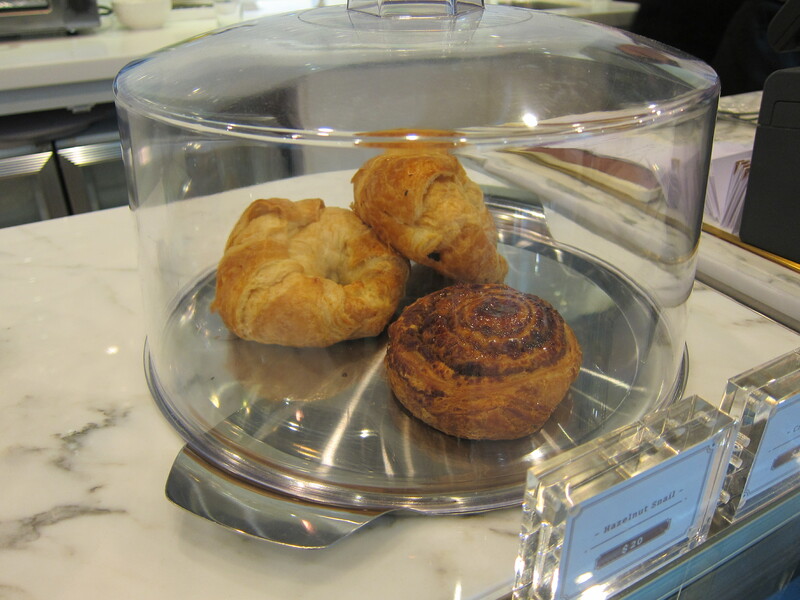 There is no denying its charm however, with the English influence seen in small details at the counter. Its name is meant to be a reflection of the high quality coffee that Mr. Pong wishes to serve to customers, alongside pretty cakes and Mövenpick icecream and I feel that the ambience of being in a stylish cafe is definitely achieved. 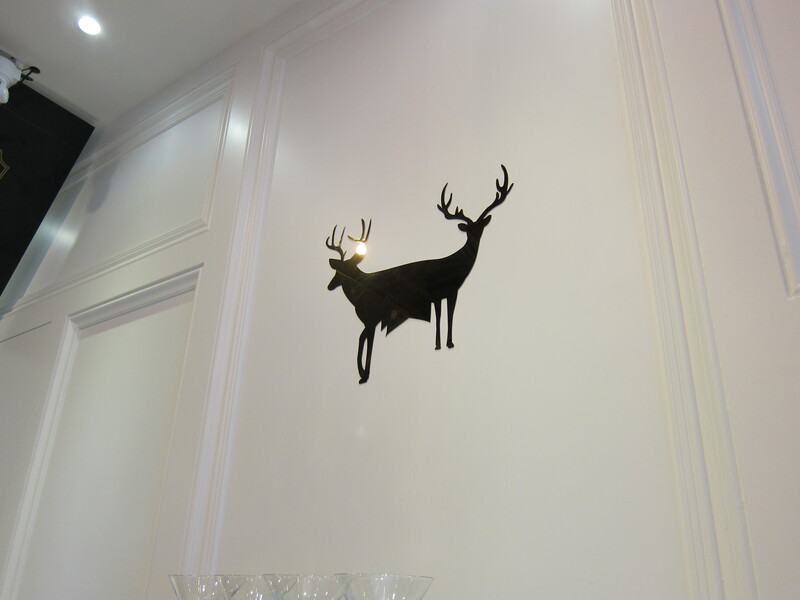 Their logo is rather cute too; two deer heads emerging from one body facing opposite directions. Looks a little odd, but the point is more philosophical, born from an idea of looking forward whilst also looking back. Something that amused me greatly was finding out that three of the baristas, including head barista Rita, were all previously Starbucks employees. Rita was at the coffee giant for six years, before deciding that she wanted the chance to be a bit more creative and step out from behind the automatic coffee machine to a semi-automatic one at Mayfair. Aside from the usual array of classic coffees and a good selection of espressos, they also serve Kenyan and Guatemala single-origin specialty coffees brewed using hand-drip or syphon methods. 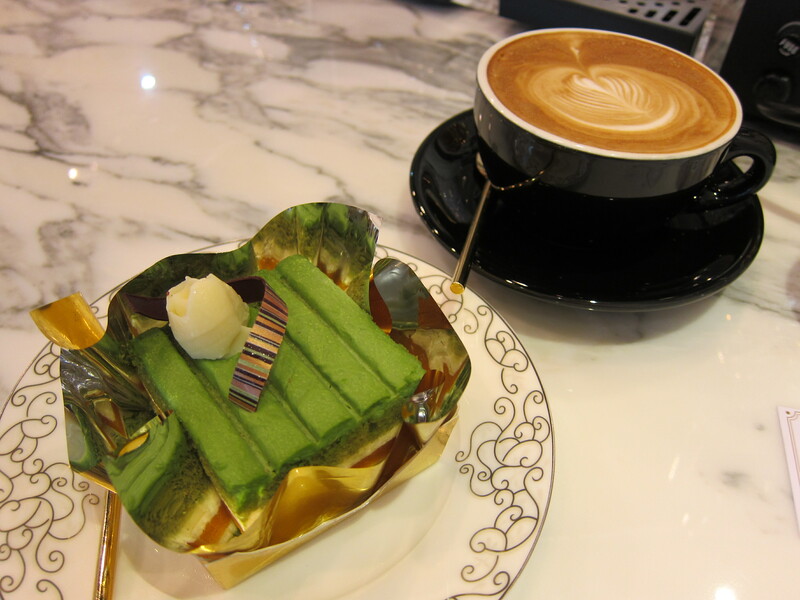 I had a latte with one of their Green tea and mandarin orange jelly cakes and thoroughly enjoyed myself. The baristas were fun and friendly and we had a good laugh chatting away at the counter. I must say my latte was excellent and smooth. I normally find the Starbucks’ version leaves a slightly bitter after-taste if I don’t add some sugar to it but at Mayfair, it was full-bodied, milky and sweet enough without additional sugar. My cake was pretty to look at and delicious to taste. 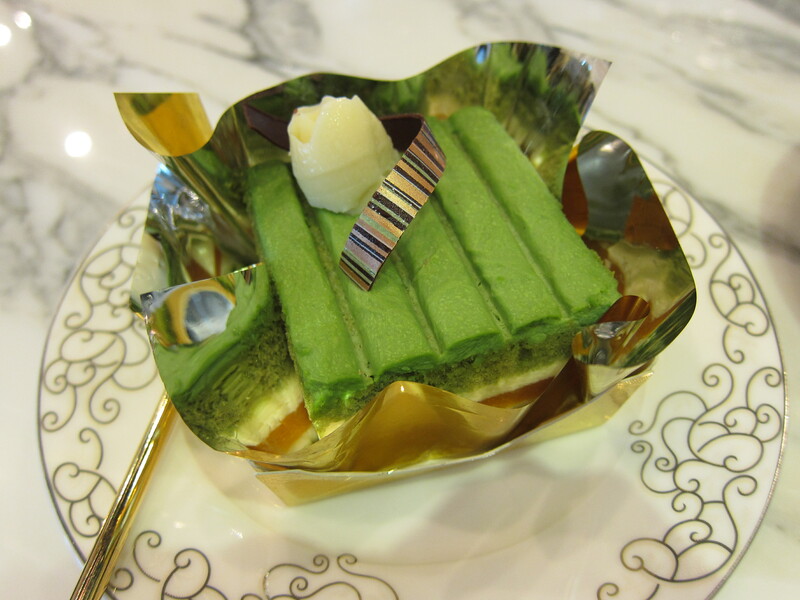 A delicate green tea flavour came through and the orange jelly gave a noticeable citrusy punch to liven the cake up. 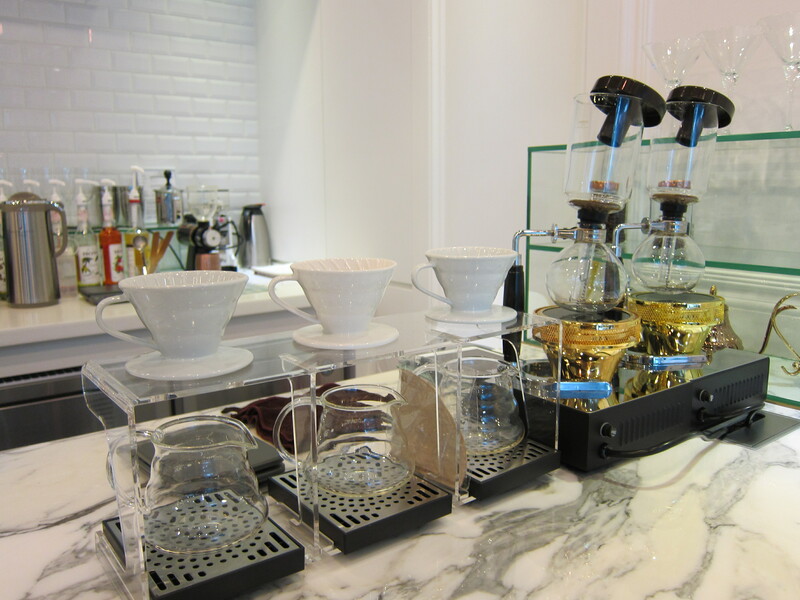 Mayfair might not be a place to hangout at per se, given its size, but it’s good to have a different coffee outlet to go to in Central that isn’t a Starbucks, a Fuel Expresso or a Holly Brown. More excitingly, they have introduced coffee workshops, so if there is interest to do a class, you can email them at info@mayfaircoffee.com. What’s my overall opinion? In short, I like it. I think I’ll be taking a short detour to the Center a bit more in the future. This was by kind invitation- many thanks Ken! 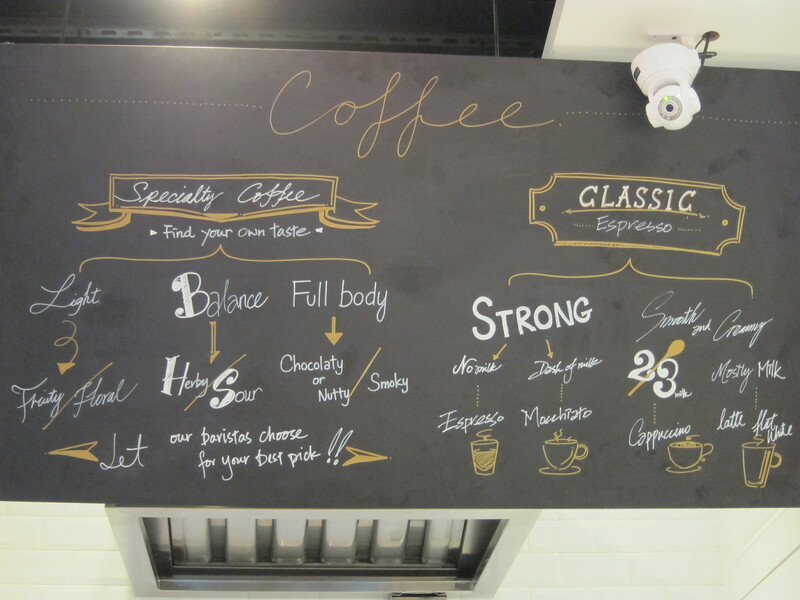 Categories: Cafe, Coffee | Tags: Cafe latte, cake, Central Hong Kong, coffee, Espresso, Guatamela coffee, Kenyan coffee, Mayfair Coffee, Mayfair Hong Kong, Semi-automatic coffee machine, Specialty coffee, The Center Hong Kong | Permalink. Michelle Ng is a Brit born Chinese-Malaysian who has loved food since time immemorial. She is a firm believer in "Live to Eat, not Eat to Live". Don't miss out on new posts- subscribe to keep up to date! Very good dinner @elementary.hk tonight. Loved the tender pork chop with the warmed apples and the EFC (Elementary fried cauliflower). Tai Hang has changed so much, so many things to explore! This Lukaniko sausage was so flavourful. Gotta love spit-roasted meat, Greek-style. When you're presented with a box of fresh off the boat (literally) sea urchin, as a gift, and one isn't terribly keen on eating it raw, pasta is the only way to go. This was my first attempt at cooking creamy sea urchin spaghetti and the recipe I found was quick and easy, and it tasted 👌🏽. Quite chuffed with how it turned out. © Michelle Ng and Chopstixfix, 2017. Unauthorized use and/or duplication of this material without express and written permission from this blog’s author and/or owner is strictly prohibited. Excerpts and links may be used, provided that full and clear credit is given to Michelle Ng and Chopstixfix with appropriate and specific direction to the original content.